I won’t go into too much detail since the process of removing and installing a toilet is so well-documented on the web. This video gets a link because it covers the whole process in just 3 minutes, while every other video I found wanted me to commit 9 whole minutes of my life to this crap. Here is our old toilet, guilty of many crimes including incontinence (it leaks water at its base), and creating intolerable levels of drama when attempting to flush loads of “a respectable size”. Removing a toilet is easy and fun. …with your bare hands! Just kidding, use a tool for god’s sake. Yes, I have cat pajamas, look upon me and despair. Here’s the plump new wax ring ready to receive new potty. Lift the potty and place it squarely on the ring. Rock the toilet a bit and sit on it to squish it down. Connect the water supply to the toilet. This might be a good time to switch to a braided water supply if your old one is a metal pipe. Turn the water supply on and let the tank fill. 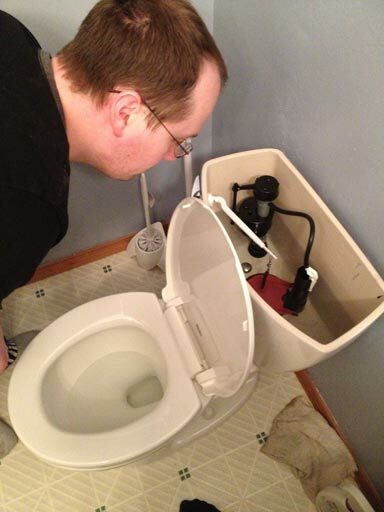 You can adjust the water level inside the tank by adjusting how high the float is allowed to go (your toilet may vary). 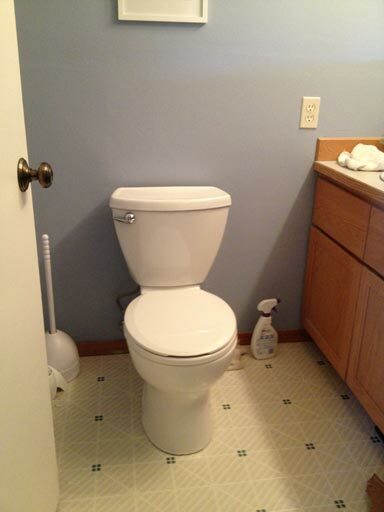 All done – a new toilet, installed all by ourselves! 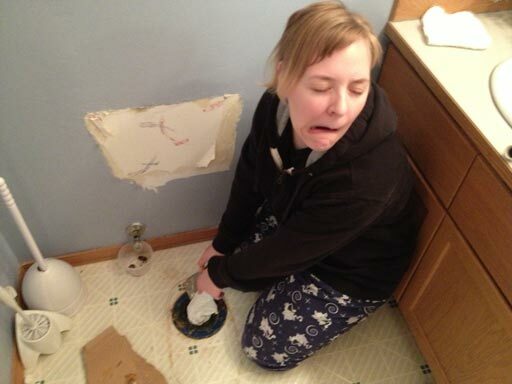 DIY toilet replacement is fun for the whole family. Can you believe Home Depot charges $120 to replace a toilet? Wow. Our local garbage pickup here won’t take them. The annual recycling event takes them, but … we missed it by a weekend. Your options are basically: smash it inside a garbage bag, haul it to the dump yourself, pay someone to take it. Update: This particular toilet lived in our computer room for two months until we paid the guys who hauled out the deck debris to take the toilet, too. They were surprisingly happy to take the toilet off our hands. 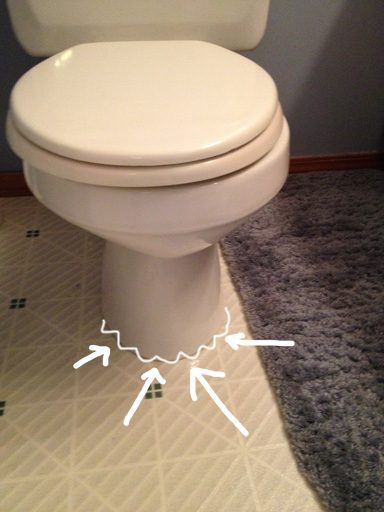 2 Min Fix: Tighten a Toilet to the Floor! Ah, just when I thought we were done with plumbing for the year… a wild leaky toilet appears! While cleaning the computer room’s bathroom, I noticed a thin border of water between the toilet’s base and the floor. 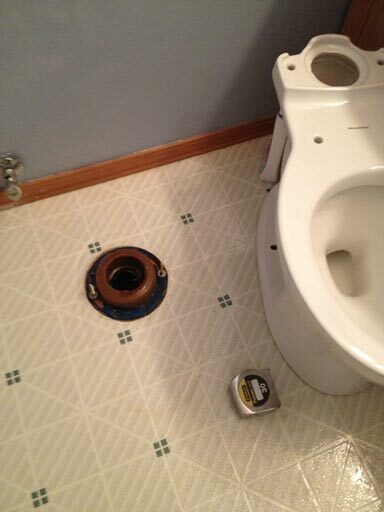 My first reaction, of course, was to completely flip out and assume the worst – new toilet, new floor, new bathroom?!?!? 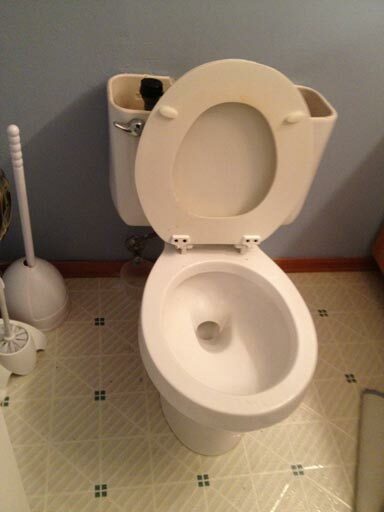 BUT… the solution was simple: the toilet just needed to be tightened to the floor! 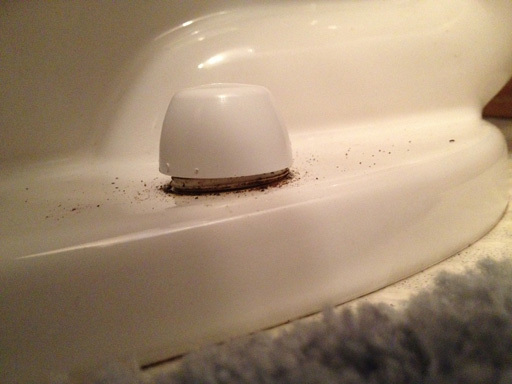 A gap nearly 1/4” in height existed between potty and floor. 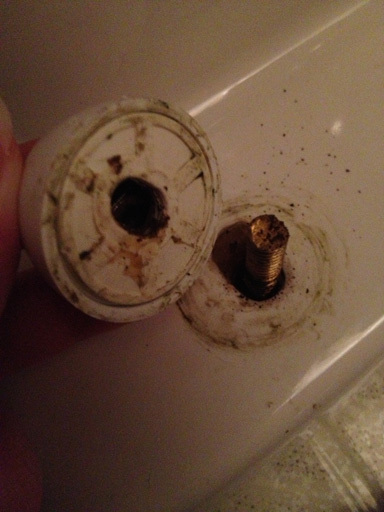 Step 1: Pop the caps off both of the bolts that hold the potty to the floor. This deserves its own step thanks to the thick seal of crusty crap holding the caps on, which I chiseled off with a screwdriver. I knew I was in trouble the second I saw this : the nut wasn’t even on the bolt anymore, it was trapped loose inside the cap. 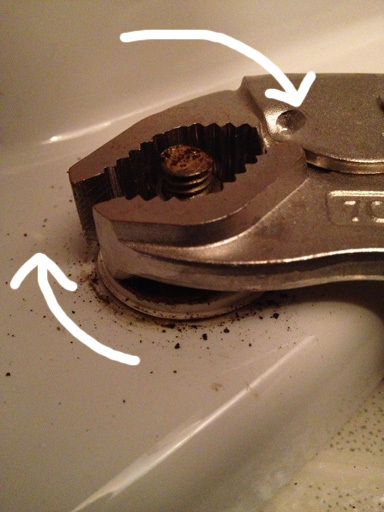 Step 2: Put the nut on the bolt if it isn’t already, and use a wrench (or a wrench-like tool) to turn the nut clockwise, bringing it down towards the toilet. Apply this to both sides equally – do a few turns on the left, then a few on the right, then go back to the left, etc. Step 3: Put the caps back on. In this case, the toilet is now too low for the caps and I’ll have to come back and saw the bolts to be a little shorter, but you might be luckier than I was. 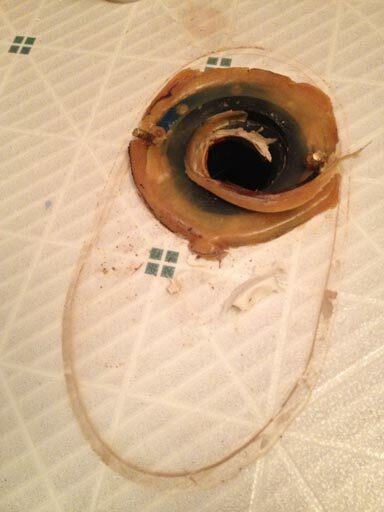 Either way, this is a minor problem compared with a water leak. 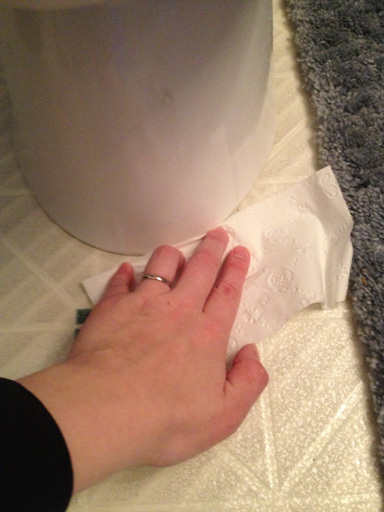 Step 4: Check for leaks 24-48 hours later I like to use some TP for this step, as it’ll absorb anything it finds.